These pre-Columbian trails were mostly constructed by the Tiwanaku civilization and then used and improved by the later Incan Empire. These stone roads and pathways show advanced engineering knowledge as they unify the Altiplano with the valleys and Amazonian Basin by passing the high mountains of the Cordilleras. This vast network of trails connects to others that stretch from Ecuador to Patagonia. 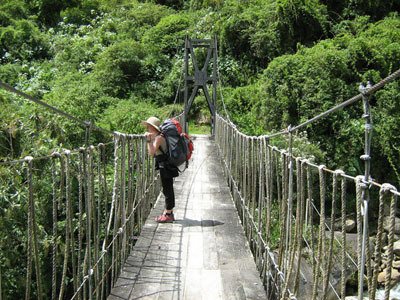 Each trail has its own difficulty level and often passes through various ecological zones rich in flora and fauna, with dazzling rivers, waterfalls, and lakes. The Ancient Takesi trail begins in the small village of Ventanilla at 3200 mts. and climbs to the trails highest point the Apacheta at 4640 meters before dropping to 2200 meters. It was constructed by the Tiwanakotas and then used by the Incas. This is a masterpiece of Native American engineering with stone gutters, tubes, and channels built to drains this high altitude road in the rainy season. It is especially impressive how the architects divided various streams into different channels. This trail that united the mountainous altiplano with the steamy jungle now begins approximately 40 Kms. to the east of La Paz, following the trail towards Ventilla at the feet of the snowcapped Mururata and Takesi mountains. One of the many beautiful sights on the trail are the houses of native farmers constructed from wood and stone. From the mighty summits of the Cordillera Real mountain range is born one of the most beautiful Native American engineered trails, the Choro. 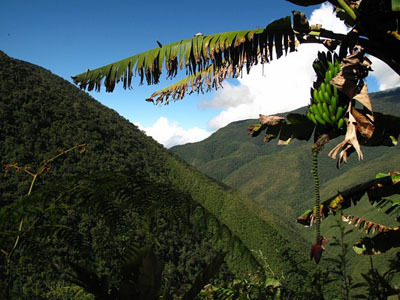 This trail was built originally by pre-Hispanic civilization of the Tiwanakota and formed a commercial link for products and people to move between the high Altiplano with the Yungas cloud forest. It was improved by the Incas and utilized as a major road by both Spaniards and Indigenous people during the colonial and republican periods. It begins some 70 Kms. from La Paz. The trail’s highest point is La Cumbre (“The Summit”) at 4,800 meters from where it descends to the village of Chairo at just 1,300 meters. The trail stretches some 60km and usually takes 3 days. Hikers traverse all manner of surfaces from stone to mud and see a tremendous range of flora and fauna. On route travelers pass pre-Hispanic ruins, ancient stone steps, hanging bridges, stone railings, ancient stone Tambos (Incan waystations) and more. 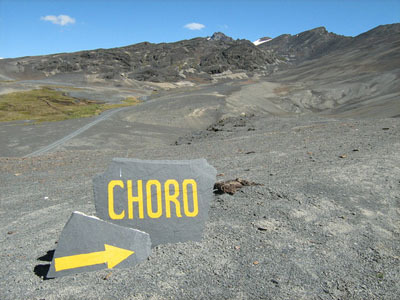 The difficulty level is moderate and hikes usually end in Coroico. 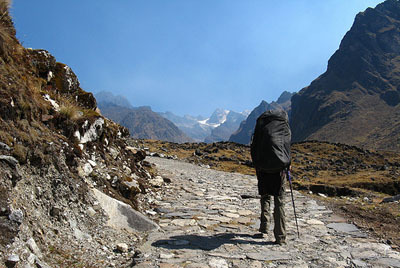 This incredible trail leads trekkers around to the hidden side of the mighty Illimani that overlooks La Paz. 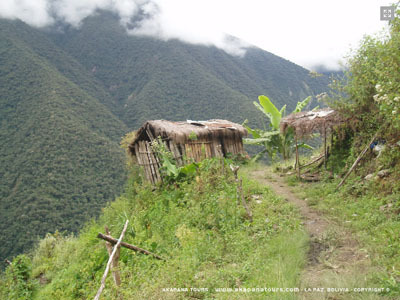 Formerly known as the Camino de Lambate, this trail showcases the thousand year engineering of the civilization of the Tiwanakota that allowed the flow of llama trains and travelers from the mountains to the jungles. The trail begins 95 Km. from La Paz at the village of Chuñavi (4.100 meters) and ends in the cloud forests at Chulumani (a 2.000 mts., Yungas) and at the Santuario de Chirca. 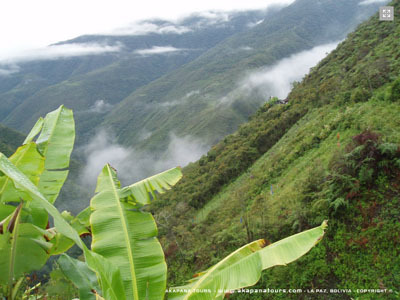 The trail’s natural beauty is staggering and hikers are likely to see soaring condors, eagles, and hummingbirds. Lodging: tents and rustic buildings. It was constructed by the Tiwanakotas and then used by the Incas and formed a commercial link for products and people to move between the high Altiplano with the Yungas cloud forest. 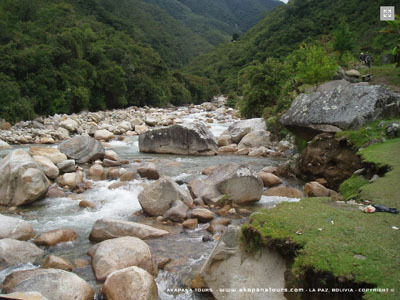 It follows the winding course of the Yani and Tipuani rivers, passing through the towns of Tipuani, Guanay, Mapiri, Caranavi and through many small gold mining camps that devastate the virgin cloud forest and contaminate the surrounding rivers. 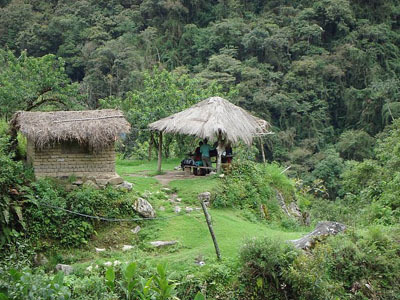 The ancient villages of Tipuani and Mapiri produced gold for the Incan Empire so local mining may span over 1000 years. This rough and tumble trail provides all kind of amazing terrains and scenery, from rock scrambles and tunnels to narrow indigenous paths that climb up towards mighty snow covered peaks like the Yani down to the steaming jungles with temperatures in the 30s ºC. The trail arrives in Guanay from where travelers can catch transportation back to La Paz. For information about trekking tours along pre-hispanic trails, please visit our tours section.